Why am I waiting? Um...you may not know this but I'm a math nerd, math teacher, actually. (Teach math and technology) So when I see equations, improbability and theory all hanging out on the cover of a BOOK? Well that just does it for me. So, I'm down for this one. Why am I waiting? Because Jennifer E. Smith's books make my heart literally soar. I've only read two so far (You Are Here and The Statistical Probability of Love at First Sight), but I am absolutely certain that Jennifer E. Smith deserves a spot on my auto-buy authors list. I am so pumped for this book, y'all. Serious grabby hands are happening over here! The Impossible Theory looks like it will be a geek feast of epic portions. 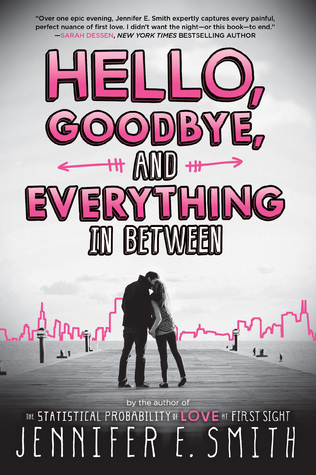 Not so sure about Hello, Goodbye though- hoping it ends in HEA. Both of these sound really good and The Impossible Theory sounds so different, so thats a plus. Great picks. Ana & Zak sounds really good. I have Jennifer E. Smith's new book on my tbr. Hopefully we enjoy reading both books.